For all the amazing smartphones , fancy technology and talking personal assistant apps, there is still a lot of convincing reasons for a globe-trotting family to have that most mundane of technology items, a pair of walkie talkies. The general reality is that as soon as you leave your home country, you lose access to phones/data – or at least at a reasonable price. Family travel inevitably ends up with parents needing to split up temporarily – and when that happens, feeling completely cut off from the spouse (and the child) can be uncomfortable. We experienced this on a recent trip to Grenada. Although we did have one cell phone with spotty service, the other didn’t work at all. We used our pair of Cobra 2-way Radios in the resort we were staying in to always keep in touch. It even worked when I walked out to the nearest corner store, a good 15 minute walk from the pool. It worked from inside the hotel buildings, and the batteries never needed to be replaced while we were on our trip. A small, $20 item ensured that even if we were at opposite ends of the sprawling resort, we were a simple “call” button away from reaching each other. If one parent’s at the beach, while the other’s at the pool – no problem to discuss lunch plans. If one person is working, and the other is taking care of the kids, a quick press of the button and plans can be formed. Highly recommended, at least until a cell phone with a truly global, affordable plan becomes a reality. And that doesn’t seem to be in the cards at all. that device is looking so good. its old but gold. 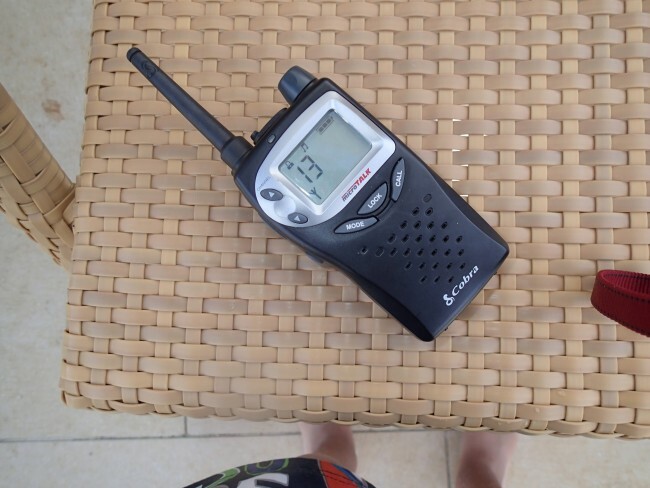 The walkie talkie is a great idea! Thanks for sharing your story!